This entry was posted in Stress Relief on November 28, 2012 by yourfriends. A pink poodle?!? A blue Bichon? A red Rat Terrier?!? Dying your pets’ fur is the latest trend in pet grooming? But is it safe? Like all other topical products, if it designed for pets’ skin and used as directed, its probably ok. There is a line of gel-type dyes made specifically for dogs, with the dye being certified safe by the Cosmetic, Toiletry, and Fragrance Association. But does that mean its ok for YOUR dog? Maybe not…Every dog can react differently to topical products. The dye must also sit for 15 minutes and lasts 4-6 washes “if applied appropriately”. At my house, its enough of an ordeal to bathe 3 dogs with shampoo, much less have them sit still for 15 minutes to be dyed… My vote? Leave it to the professional groomers at Grooming Shows! This entry was posted in dyed fur, Grooming on November 21, 2012 by yourfriends. 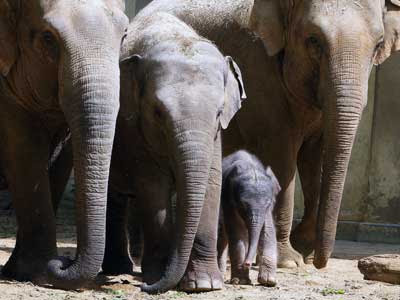 The zoo has built three large containers, each capable of holding about 100 cubic meters of animal waste –which is approximately a week’s worth of dung collected from all the vegetarian animals in the zoo. The dung is then mixed with warm water and the bacteria in the dung is left to decompose in an oxygen-free environment for 30 days. The resulting biogas, mainly comprised of methane and carbon dioxide, rises naturally through vents in the ceiling to a corrugated hut on the roof where it’s collected in a “big balloon” which resembles a small Zepplin. The biogas is then fed into a gas-powered engine that’s used to generate electricity. “When you turn the biogas into electricity, it creates heat which we also store,” Munich Zoo park supervisor Dominik Forster told CNN. “This is then used to warm the gorilla enclosure, — but it could be used to heat about 25 homes,” he added. Apparently, dung alone does not produce all that much energy relative to its size, and by the time the food has been digested by the animal, a lot of the energy in it has been used up or burped out. However, using animal waste to create electricity, heat or fertilizer is important in helping change our mindset from dependence on one source of energy to many different complementary sources. This entry was posted in biogas, poo power on November 14, 2012 by yourfriends. Owney was a scruffy mutt who became a regular fixture at the Albany, New York, post office in 1888. His owner was likely a postal clerk who let the dog walk him to work. Owney was attracted to the texture or scent of the mailbags and when his master moved away, Owney stayed with his new mail clerk friends. He soon began to follow mailbags. At first, he followed them onto mail wagons and then onto mail trains. Owney began to ride with the bags on Railway Post Office (RPO) train cars across the state and eventually the country! In 1895 Owney made an around-the-world trip, traveling with mailbags on trains and steamships to Asia and across Europe, before returning to Albany. Railway mail clerks considered the dog a good luck charm. At a time when train wrecks were all too common, no train Owney rode was ever in a wreck. The Railway mail clerks adopted Owney as their unofficial mascot, marking his travels by placing medals and tags on his collar. Each time Owney returned home to Albany, the clerks there saved the tags. Postmaster General John Wanamaker was one of Owney’s fans. When he learned that the dog’s collar was weighed down by an ever-growing number of tags, he gave Owney a harness on which to display the “trophies.” On April 9, 1894, a writer for the Brooklyn Daily Eagle reported that “Nearly every place he stopped Owney received an additional tag, until now he wears a big bunch. When he jogs along, they jingle like the bells on a junk wagon.” In June, Owney boarded a mail train for Toledo, Ohio. While he was there, he was shown to a newspaper reporter by a postal clerk. Owney became ill tempered and although the exact circumstances were not satisfactorily reported, Owney died in Toledo of a bullet wound on June 11, 1897. Mail clerks raised funds to have Owney preserved, and he was given to the Post Office Department’s headquarters in Washington, D.C. In 1911, the department transferred Owney to the Smithsonian Institution, where he has remained ever since. 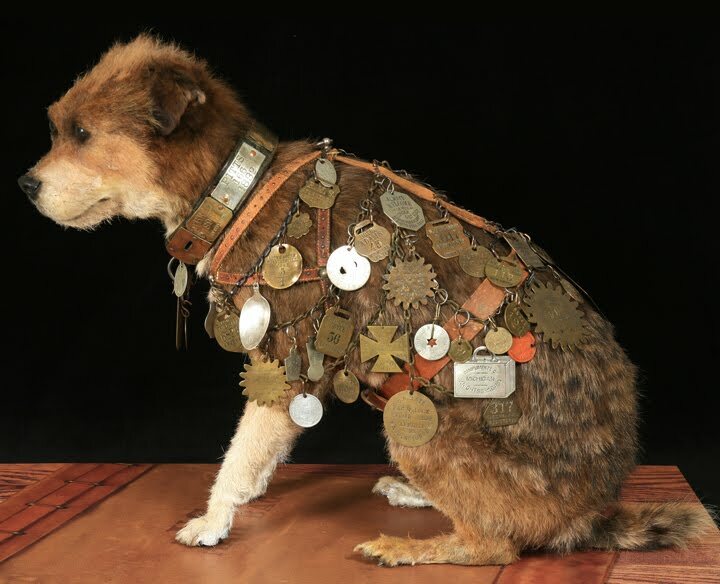 Owney can be seen on display in the National Postal Museum’s atrium, wearing his harness and surrounded by several of his tags. This entry was posted in Owney, Postal Service dog on November 7, 2012 by yourfriends.